Pre-ordering your watch allows you to customize to your taste. We will assemble your watch especially for you by allowing you to combine all case, watch face and strap options. The strap lugs are placed slightly lower and more centred than the typical lugs, and are separate pieces that have been soldered to the case. Notches on the inside create a refined transition from case to strap, contributing to the fine nature of the watch. The shape of the watch suggests and ellipsis and is created with domed sapphire crystal and a concave curvature on the back of the watch casing. This ergonomic and elegant detailing marries the design to the natural contour of the wrist. High Quality Swiss Made STP 1-13 (optional) automatic movement with 26 jewels. Standard model equipped with STP 1-11 movement. 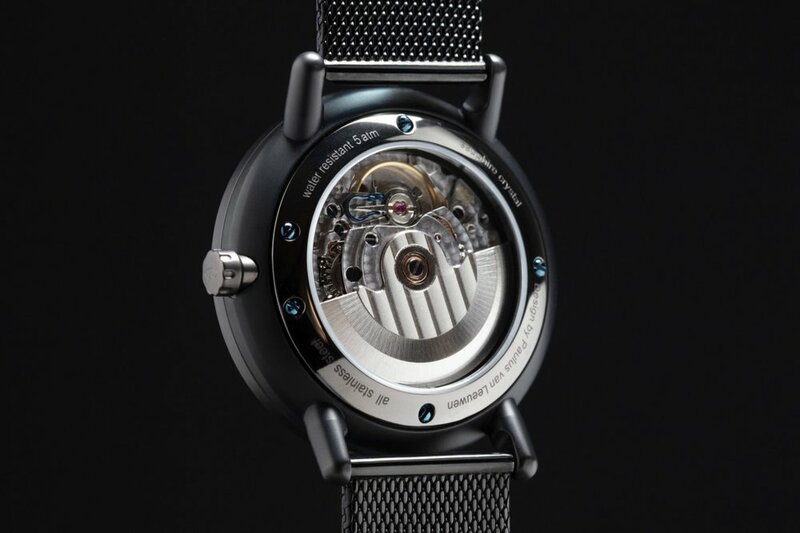 Eleven will be Swiss Made in Bienne, Switzerland by Pierre Junod. Pierre Junod and Paulus van Leeuwen work closely together for a long time already on many aspects of the design, production and marketing of watches with an aesthetic and contemporary touch. Established in 1994, Pierre Junod manufactures watches by renowned designers and architects including, Lella & Massimo Vignelli, Mario Botta and Michael Graves. We know and trust that Pierre Junod has the same approach towards quality as we have. Dimensions: 40 mm diameter x 10.5 mm height. Stainless steel Milanese mesh strap.